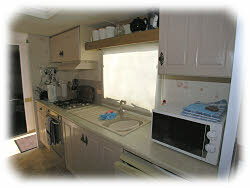 A static caravan is also available for letting, sleeping up to 2 adults and 2 children. 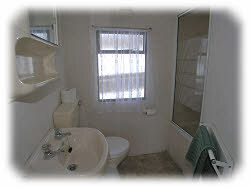 This is a simply furnished caravan, with the emphasis firmly on cleanliness. Electricity, gas and linen are included, and the caravan enjoys unparalleled views. 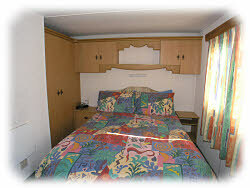 There is a shower and toilet in the caravan, a double bedroom, and a twin bedroom suitable for children. The kitchen has a microwave etc, and there is a TV/video with freeview in the caravan. 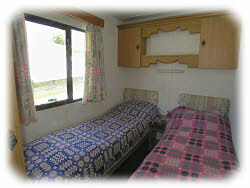 This holiday caravan is available for let from Easter to mid October. Please observe the site rules. No entertaining in the holiday caravan, only booked persons allowed in. 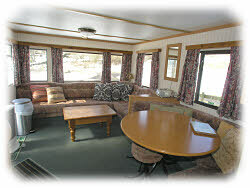 The caravan is available for let from Easter to mid October. The family rate is for 2 adults and up to 2 children. 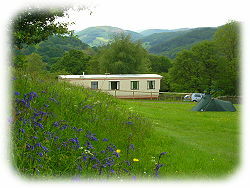 Copyright Rynys Farm Camping Site nr Betws-y-Coed, Snowdonia. All rights reserved.